Nothing beats the view at AJ’s on the River, which overlooks the scenic Alafia River in Gibtown, “the last ‘freakshow’ town in America,” according to The Guardian. Nothing beats enjoying a delicious Goat Cheese Burger and an ice-cold beer on the outdoor deck of this laid-back eatery, which promises “good music, delicious food and tasty cocktails!” AJ’s lies off I-75 at Exit 250 (9808 Vaughn Street). A funky fishing community located just west of Pine Island (4271 Pine Island Road), Matlacha is home to several seafood joints, a couple of colorful art galleries and gift shops, and the “Fishingest Bridge in Florida.” A visit to Matlacha is not complete without stopping at Bert’s Bar & Grill, a local institution that features delicious cuisine, ice-cold beer and scenic waterfront views, as well as live entertainment nightly. Ideally located at Angler’s Resort in Dunnellon (12189 South Williams Street) just down the road from Rainbow Springs State Park, The Blue Gator offers an expansive outdoor deck that overlooks the Withlacoochee River. The menu features burgers, sandwiches, steamed shrimp, raw oysters, chicken wings and more. Enjoy live music here Thursday through Sunday nights, as well as airboat tours and boat rentals. 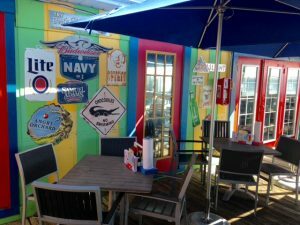 The next time you are cruising down the Overseas Highway toward Key West, make plans to take a little detour and check out Burdines Waterfront Chiki Tiki Bar & Grille, a laid-back, open-air bar and grill in Marathon that’s as cool as its name! The Chiki Tiki Bar & Grille overlooks the scenic Boot Key Harbor Waterway, making it the perfect locale to chill out and enjoy an ice-cold beer or refreshing cocktail along with an Angus beef burger or blackened fish sandwich. To reach the Chiki Tiki, simply turn left onto 15th Street (Mile Marker 49.5) past an old trailer park to 1200 Oceanview Avenue.